These days smart speakers are nothing new but they are still evolving. 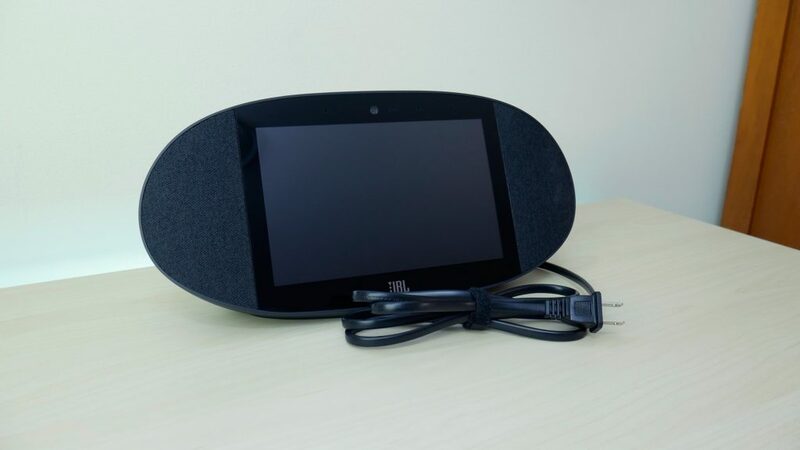 Just as with the Echo and later the Echo Show, Amazon was first to the party. 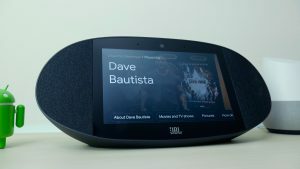 Now, Google is once again playing catch up with their very own smart displays hitting the market. 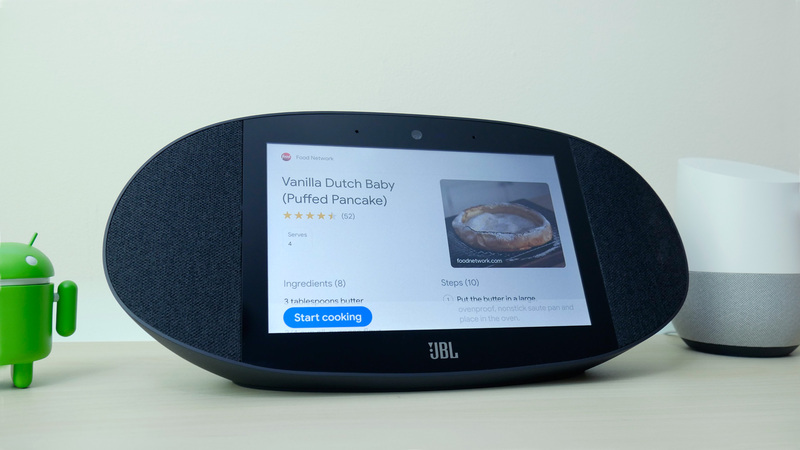 First came the Lenovo Smart Display which was quickly followed by the JBL Link View. At this moment they are the only two players in the market for a Google Assistant powered smart display. For the past few weeks, I’ve been using the JBL Link View with much delight and a few gripes. 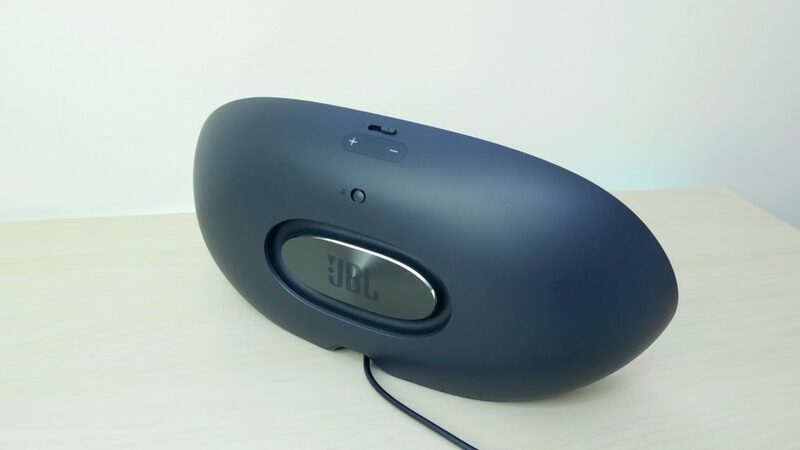 The JBL Link View comes in an oblong pill shape that seems more like a display has been slapped on a speaker than a display with speakers attached. This should come as no surprise since JBL is first and foremost an audio company. Upon opening the box, I found the design to be wider and bulkier than I expected. I can’t say I was immediately a fan of the design but as time went on it grew on me. One aspect of the design that really stood out to me is the size of the bezels around the display. In a world where bezels are constantly shrinking on our phones, computers, and TVs it is a bit strange to see such large bezels on a new device. If it were a tablet the bezels might make sense but smart displays are not tablets and not designed to be held during usage. 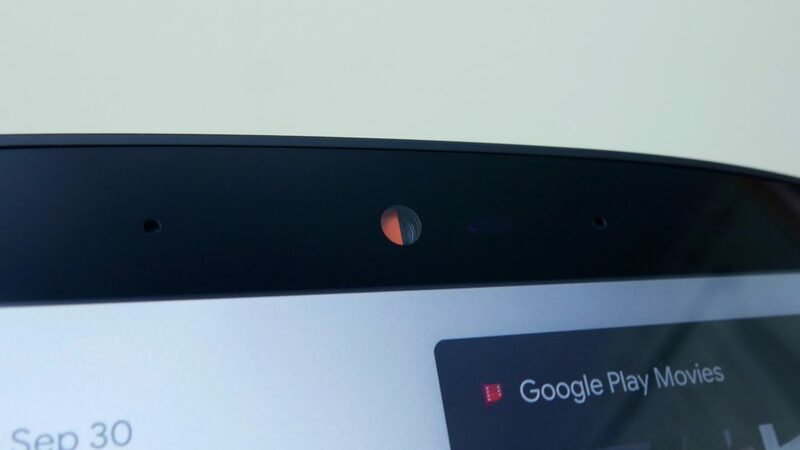 JBL isn’t the only one guilty of this, as every smart display that I’ve seen so far includes large bezels. The next thing that stood out to me was the privacy switch. If you’ve been concerned about bringing a connected camera into your home, the privacy switch is a nice reassuring feature. The privacy switch is a one hundred percent manual slider switch that completely covers the camera with an orange piece of plastic. This makes it easy to see whether or not your camera is blocked. As with other smart speakers on the market, there is also a mute switch on the back and volume controls. Even though you’ll most likely be controlling the volume with voice commands or by using the on-screen controls these controls are still handy to have. One of the reasons you’ll most likely be using the voice commands is if you decide to put this in the kitchen. After using the JBL Link View for the past week I found that is one of the best rooms for a smart display to live. In order to make the Link View even more kitchen friendly, it comes with an IPX4 rating making it splashproof. That’s not quite as good as many new phones but it should stand up to the occasional splash in the kitchen without issue. A small and often overlooked design element is the power plug. If you’re like me with a house full of gadgets crowding your outlets, then you’ll be happy to know the Link View doesn’t feature a large boxy plug. It was really refreshing to see the power cable used a normal sized plug instead of some oddly shaped large rectangle. Thankfully, JBL saw fit to hide all the components in the Link View itself and provide you with a small normal sized power plug that wouldn’t crowd your surge protector. I was a little disappointed at first when I read that the 8-inch display on JBL Link View would only have a 720p resolution. In a world of QHD phones and 4K TVs, the thought of using a 720p screen seemed like a big step backward. However, in practice, I found this was not an issue at all. Most times you’ll be at least three feet or more from the display and at this distance, you won’t notice the lower resolution. During my time watching YouTube videos or movies from Google Play I found no issues with the video quality. It definitely was not as good as my phone, tablet, or TV screen but a smart display isn’t really designed around media consumption. It is there to help give you visual results and information and it does this well. I did find some light leaking around the top and bottom bezels and that was unfortunate. Overall it was only a minor issue because it is only visible when the ambient display is on. How Good is the Screen? 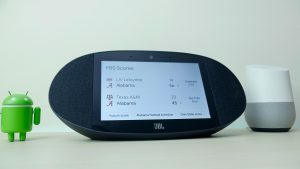 Personally, I have loved having a screen on my smart speaker. I’m a visual person and getting visual feedback from my commands and questions is quite satisfying. 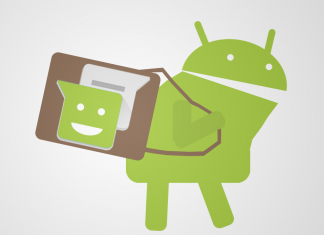 The animations were all smooth and flowing, reminiscent of the material design we’ve come to know and love. I enjoyed asking for the weather and seeing the forecast pop up on the screen. Controlling your smart home is also made easier by providing extra controls on screen whenever you turn the lights on or off. Besides the ability to toggle lights on or off, you’re also presented with controls for brightness and color. These controls will linger on the screen for a while giving you plenty of time to access them which is a nice touch. Using it for recipes in the kitchen is fantastic since it gives you step by step instructions that you can advance hands-free. Even better you can bring up a recipe video on YouTube with ease. Another way it makes a great kitchen companion is by allowing you to watch movies through Google Play or catch up on your YouTube videos. 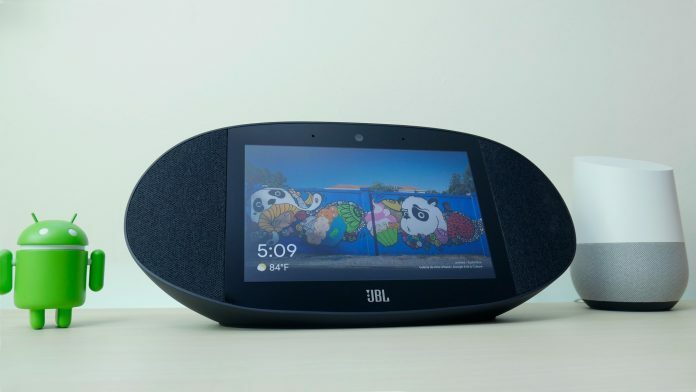 While it plays music just like any other Google Assistant speaker with the screen it also allows you to watch the music videos via YouTube. If you happen to have YouTube TV you’ll even be able to watch TV on it. Beyond watching videos I also appreciated the other ways it would show information. Whether that be showing a picture related to my question or providing follow up questions at the bottom of the screen. Often times it leads me to click on related questions and learning more about the subject. I also enjoyed some of the added touches such as providing a breakdown of scoring quarter by quarter when asking for the football score. Little additions such as this show how Google put thought into how to utilize the display in useful ways, providing an improved experience over an audio-only device. That doesn’t mean it still doesn’t have a long way to go. There is still a lot of room for improvement and innovation. For instance, when turning on a light it was fantastic to see the controls pop up on the screen. I loved that I could toggle the light on/off, change the color, or brightness of the bulb. Features like this would make a smart display the perfect smart home hub. Unfortunately, there is no way to bring up some sort of hub to give you full control over your smart home devices. I found myself giving variations of “show me my lights” commands hoping to get a screen for controls over every light in my home. Sadly, there was no way to do this. There is also no way to view my Arlo cameras at this time. READ MORE: What are smart displays and what good are they? Another feature that would have been beneficial is viewing the weather radar. I tried several commands but could never get this to work. Making video calls using the JBL Link View worked well but you are limited to only using Duo. Unfortunately, not many people use Duo and support for some other video calling apps would be much appreciated. Speaking of video calls, the Echo Show offers the ability to “drop in” and view your home through the camera. This is yet another feature I wish Google smart displays included. Having the ability to call my smart speaker through Duo or view it through the Google Home app would be such a convenient way to check on things while I’m away. The ambient display also leaves much to be desired. This comes on after the display has been idle for a while showing only a small clock in the bottom left-hand corner. If this clock were larger it would be easier to read from several feet away or even from across the room. Furthermore, I’d love if it offered some more info or customization. Perhaps allowing you to adjust the clock to the size you see fit and show more information like the weather. 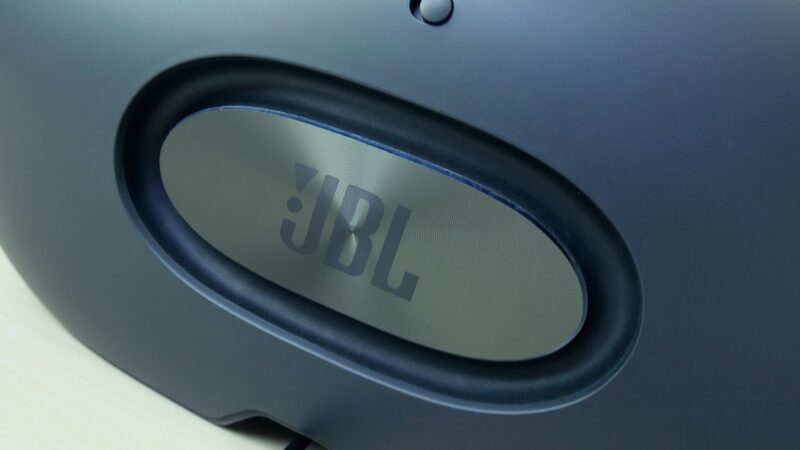 With JBL’s audio prowess it should be no surprise that the JBL Link View has outstanding audio quality. The two speakers on the front provide stereo sound while a passive radiator on the back makes sure you feel the bass. This helped give a balanced sound with plenty of clarity in the mids and highs along with hard hitting bass. After weeks of using the JBL Link View, I’ve come to love having a screen on my smart speaker, but it’s not yet essential. I use smart speakers every day and I’ve been a big fan of them since my first Echo speaker and later my Google Home speaker. 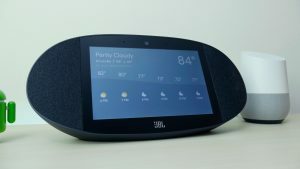 Similar to when the Google Home was first launched smart displays right now are full of potential which isn’t yet realized. 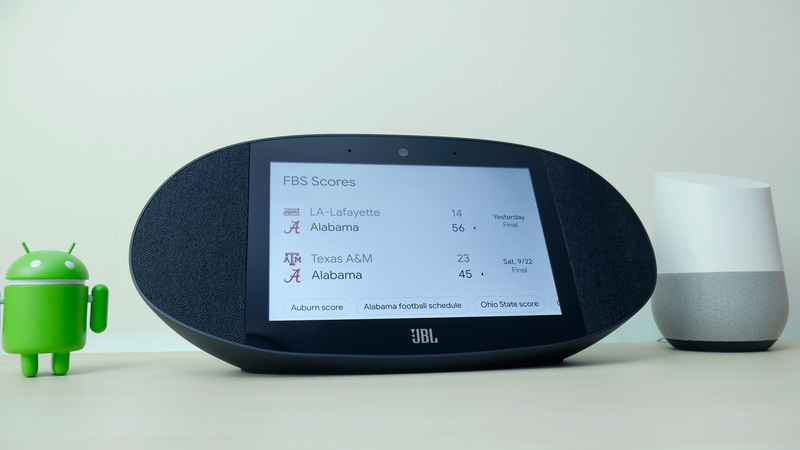 Even if they only have a limited use, for now, the JBL Link View has sold me on smart displays. The great thing about smart displays or speakers is they will continue to evolve and improve over time. When I first got the Google Home it couldn’t do half of what it is capable of now. The same will be true for smart displays. Over time it will improve and gain new abilities becoming a vital part of your smart home. 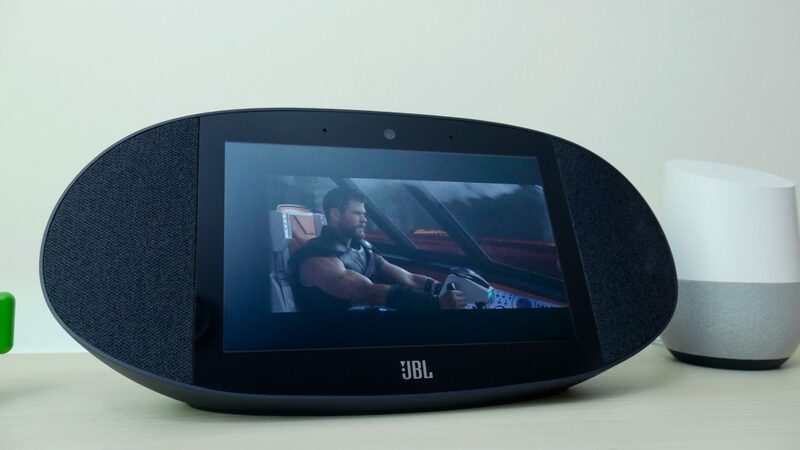 As long as you don’t need the larger screen size offered by the Lenovo smart display, the JBL Link View is the clear way to go. No other smart display currently offers this level of sound quality and you’ll be grateful for that every time you start your favorite playlist or queue up a video to watch.